It's Spring! Let's Ride a Train! What better way to celebrate the coming of Spring than on board a train? We will be taking our ‘Silver Fleet’ of Silver Lariat, Silver Rapids, and Silver Solarium from Los Angeles to Washington DC, then on to Charlotte, North Carolina, where they will participate in the 2017 excursions of former N&W 611. March 28, 2017 we depart Los Angeles on a transcontinental trip using our Silver Fleet of cars. Intermediate points include Oakland/Emeryville and Chicago. Our destination will be Washington DC. Those wishing to continue may do so to Charlotte, NC. Arrival Charlotte will be April 3. Please note that we will be arriving in DC at a time that traditionally sees the peak bloom of the cherry trees. We will provide our famous service, with meals served on our monogram china, on table linens from the original California Zephyr. Full bar service featuring premium labels of beer, wine, and spirits is of course included. Sleeping accommodations include Roomettes, Double Bedrooms, a Drawing Room, and a Stateroom. Total sleeping capacity will be 24 guests. Our cars will be coupled on the rear of various Amtrak trains that will take us to our destination. We will take the Coast Starlight, California Zephyr, Capitol Limited, and Carolinian. We will have chefs on board who prepare meals from scratch, using fresh, frequently locally-sourced ingredients. We can accommodate most dietary needs, provided we are informed of them in advance of the day of departure. On longer trips we vary the entrees, and may include various fish, shellfish, pork and lamb as well as beef and chicken. Meals will generally be served in Silver Lariat. Overnight passengers will get preferential dome seating for meals. Our complimentary bar service features premium labels of beer, wine, champagne, and spirits. We can usually accommodate special requests. Roomettes: 1 person. Murphy bed. Day accommodation is a sofa-style chair. An upholstered bench seat accommodates day visitors. Roomettes have sinks with hot and cold running water. Toilets are located a few feet down the aisle. Double Bedrooms: 1 or 2 persons. 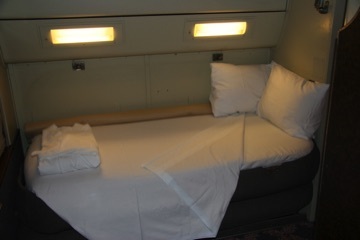 These rooms feature an upper and a lower berth, and a restroom annex that includes toilet and sink. Some double bedrooms also have European-style hand-held showers in the annex. Drawing Room: 1, 2, or3 persons. This room features one upper and two lower berths, as well as a restroom annex that is considerably larger than the others. In addition to toilet and sink it has a fixed-head shower. Stateroom: 2 persons. 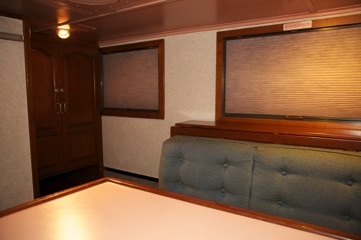 The Stateroom features booth seating by day that makes down into a double bed. It has a generous closet, and its restroom annex features a fixed-head or hand-held shower. Bedroom On Suite: Several of our double bedrooms feature a folding wall that when open makes into a spacious room that can accommodate up to 4 guests. Shower/changing room in the roomette end of Silver Rapids. All guests, including those whose rooms have a shower, are welcome to use it at any time. Bathrobes, of white cotton terry are provided to all of our guests. Individual bar soap, shampoo and conditioner will be found in each annex or medicine cabinet. White cotton terry washcloths and bath towels will be found in each room. Hand towels are of Huck material. This is the same material that was used by Pullman. We starch our Huck towels. White cotton percale sheets and pillowslips are starched and pressed providing that crisp look found nowhere else among private railcars. All of our beds are made with triple sheets. 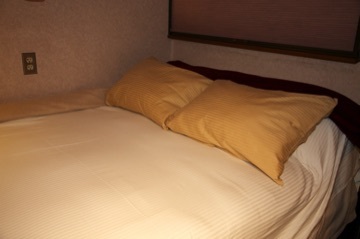 Each bed has two blankets and two pillows for guest comfort. Mar 28: We depart Los Angeles Union Station on Amtrak train #14, 10:10 AM; Arrive Oakland Jack London Square 9:24 PM. For those guests continuing east with us, our train will depart Oakland Jack London Square for Amtrak’s West Oakland yard, where the cars will be cut off, and added to Amtrak’s California Zephyr, train #6, which is being serviced on an adjacent track. Here we will spend the night. This is a live rail yard that operates 24/7. Only authorized personnel are allowed off the cars. Meals today: Breakfast, Lunch, hors d’Oeuvres, Dinner. Mar 29: Our train leaves the yard about 8:30 AM and travels to Emeryville station where the Zephyr’s passengers as well as new ones joining us board for the trip east. Departure from Emeryville will be 9:10 AM. The train travels to Sacramento, then begins an almost 90 mile climb to the summit of the Sierra Nevada, at Donner Pass. Signs are good at the moment that we will see lots of snow. Reno is reached about 4:00 PM. Shortly after departing Reno we leave the mountains for a fast run across the Nevada desert. I-80 roughly parallels the railroad. Overnight our route roller-coasters through several passes and valleys, finally descending from Silver Zone to the Salt Lake Desert floor at Wendover. At the Nevada-Utah state line, time advances one hour. Salt Lake City is reached around 3:05 AM. Insomniacs are welcome to step outside for some fresh air while our train is being serviced. Meals: Breakfast, Luncheon. Hors d’Oeuvres and Dinner after departure from Reno. Mar 30: Departure from Salt Lake City is 3:30 AM. Hot and cold beverages will be available for day riders boarding in Salt Lake City to tide them over until the breakfast hour. Around 5:30 AM our train will begin its climb of the Wasatch range to Soldier Summit. The highway that follows us is US 6, which will be our companion for the next several hundred miles. Grand Junction CO is reached at 10:23 AM. This is a minor servicing stop and crew change for the train, so feel free to step out and stretch your legs. 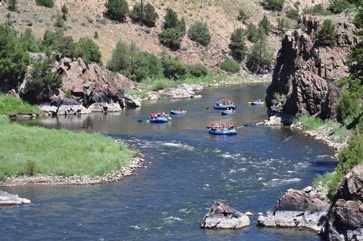 Next stop is Glenwood Springs, which is also a ‘fresh air’ stop. Denver is reached at 6:38 PM. We will be here for approximately 30 minutes, so do walk into the renovated Union Station, and make a note to yourself that Denver is a must-return destination! Departing Denver at 7:10 PM, we cut diagonally across northeastern Colorado and enter Nebraska. Most of Nebraska is traversed under cover of darkness. Meals: Breakfast, Luncheon, hors d’Oeuvres and Dinner, served prior to arrival in Denver. Mar 31: Omaha is reached at 4:59 AM. Earlybirds are welcome to step outside while the train is being serviced. The 1890’s era Burlington Station building was recently refurbished and is now the headquarters for one of the area’s TV stations. Omaha is exactly 500 miles from Chicago, which we will reach at 2:50 this afternoon. Meals: Breakfast, Luncheon. In Chicago all guests detrain. 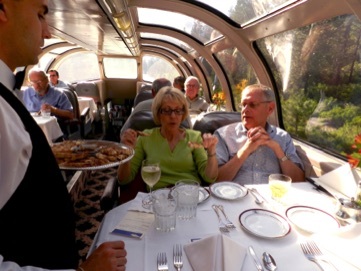 Apr 1: Silver Rapids and Silver Solarium depart 6:40 PM on Amtrak train 30, the Capitol Limited. Due to tonnage considerations, Silver Lariat may depart that same evening on Amtrak train 50, the Cardinal. Dinner will be served upon departure Chicago. Apr 2: Cars arrive Washington DC. Guests continuing with us to Charlotte are welcome to stay aboard the cars in Washington Union Station. Meals: Breakfast, Luncheon. Apr 3: Those people with rooms aboard Silver Rapids will transfer to Silver Lariat this morning for the day trip to Charlotte. Departure WAS is 10:53 AM. Arrival Charlotte is 8:12 PM. Charlotte is the end of our trip, and all guests depart for hotel. Meals: Breakfast for passengers who stayed aboard the previous night; Luncheon hors d’Oeuvres and dinner for all passengers. 5% Earlybird discount for reservations received by Jan 28, 2017. Terms: For reservations made prior to Feb 28, 2017, 10% (minimum $750) due at booking; balance due Feb 28. For reservations made after Feb 28: Payment in full due with booking. Your payment guarantees your reservation. We will invoice deposits and balances separately. We accept Visa, Mastercard and American Express. A 3% convenience fee will be added to the total for those paying by credit card. Click HERE to book this trip!